Retail may only be half dead. A nearly 7% increase in holiday season comps sent shares of Kohl's Corp. (KSS - Get Report) soaring in trading Monday and the stock was rising Tuesday morning. Kohl's shares are up nearly 40% over the past 12 months, well ahead of the 6% increase the SPDR S&P Retail ETF (XRT - Get Report) has experienced over the same period. Target Corp. (TGT - Get Report) has been on a roller-coaster ride so far this year, but Tuesday the company announced that it saw a 3.4% increase in same-store sales during the holiday season, sending the stock rising more than 3% in morning trading. The company raised its fourth-quarter adjusted EPS estimate as a result to between $1.30 and $1.40 per share from its previous view between $1.05 and $1.25 per share. Kohl's has had a resurgence over the past 12 months. J.C. Penney Co. (JCP - Get Report) reported a 3.4% growth in holiday season comps, also well ahead of FactSet's consensus estimate of 0.8% growth. The stock is up 17% year to date and has risen 7% over the past five sessions. However, the stock was down more than 1% Tuesday. Teen retailer American Eagle Outfitters Inc. (AEO - Get Report) also seemingly had good news for investors Tuesday, but markets reacted to the company reiterating its earnings guidance by dropping the stock more than 4%. American Eagle reported an 8% increase in holiday comps and reiterated its EPS guidance between 42 cents and 44 cents per share. American Eagle shares are down 4.5% year to date, but the stock is up about 25% over the past 12 months. Other retailers that also had strong holiday season numbers like Macy's Inc. (M - Get Report) are not seeing the same success on Wall Street. Last week Macy's reported a 1% increase in same-store sales, well ahead of the FactSet consensus estimate of a 1.7% decline. The stock has fallen more than 7% over the past five sessions and was down more than 10% at one point during that period. The stock was up 1% in morning trading Tuesday. 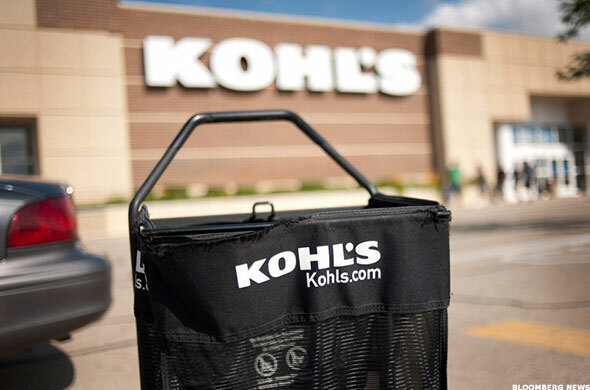 Kohl's meanwhile was down 0.3% Tuesday morning after a strong runup. And if you are a struggling retailer, forget about it. Fellow teen retailer Express Inc. (EXPR - Get Report) was down more than 16% Tuesday morning after the company said that the holiday season was disappointing. "Our performance during December was most challenging in our retail stores, where traffic was worse than expected," Express CEO David Kornberg said. The company expects same-store sales to drop between 1% and 2% in the quarter, and 4% on the year. The company said that it expects to earn between 31 cents and 33 cents in the quarter, about a dime short of the market's consensus 43 cents per share expectation. The SPDR S&P Retail ETF was down 0.48% in morning trading Tuesday.